"Mission control" redirects here. For other uses, see Mission control (disambiguation). A mission control center (MCC, sometimes called a flight control center or operations center) is a facility that manages space flights, usually from the point of launch until landing or the end of the mission. It is part of the ground segment of spacecraft operations. A staff of flight controllers and other support personnel monitor all aspects of the mission using telemetry, and send commands to the vehicle using ground stations. Personnel supporting the mission from an MCC can include representatives of the attitude control system, power, propulsion, thermal, attitude dynamics, orbital operations and other subsystem disciplines. The training for these missions usually falls under the responsibility of the flight controllers, typically including extensive rehearsals in the MCC. Prior to liftoff, missions are controlled from the Launch Control Center (LCC) located at NASA's Kennedy Space Center on Merritt Island, Florida. Responsibility for the booster and spacecraft remains with the LCC until the booster has cleared the launch tower, when responsibility is handed over to the NASA's Mission Control Center (MCC-H), at the Lyndon B. Johnson Space Center, in Houston. The MCC also manages the U.S. portions of the International Space Station (ISS). European Space Operations Centre (ESOC) is responsible for ESA's satellites and space probes. It is located in Darmstadt, Germany. German Space Operations Center (GSOC) is responsible for DLR's satellites and other customer's missions. It is located in Oberpfaffenhofen near Munich, Germany. The Columbus Control Center (Col-CC) at the German Aerospace Center (DLR) in Oberpfaffenhofen, Germany. It is the mission control center for the European Columbus research laboratory at the International Space Station. The [Galileo Control Center] (GCC) at the German Aerospace Center (DLR) in Oberpfaffenhofen, Germany. It is one of the mission control centers for the European Galileo Navigation System. The Mission Control Center of the Russian Federal Space Agency (Russian: Центр управления полётами), also known by its acronym ЦУП ("TsUP") is located in Korolyov, near the RKK Energia plant. It contains an active control room for the ISS. It also houses a memorial control room for the Mir where the last few orbits of Mir before it burned up in the atmosphere are shown on the display screens. Beijing Aerospace Command and Control Center is a command center for the Chinese space program which includes the Shenzhou missions. The building is inside a complex nicknamed Aerospace City. The city is located in a suburb northwest of Beijing. The Jet Propulsion Laboratory (JPL) in Pasadena, California manages all of NASA's uncrewed spacecraft outside Earth's orbit and several research probes within along with the Deep Space Network from the Space Flight Operations Facility. Boeing Satellite Development Center (SDC) Mission Control Center in El Segundo, California, US. In charge of several military satellites. Goddard Space Flight Center in Greenbelt, Maryland provides mission control for the Hubble Space Telescope. Lockheed Martin A2100 Space Operations Center (ASOC) in Newtown, Pennsylvania, US. In charge of several military satellites. Mercury Control Center was located on the Cape Canaveral Air Force Station and was used during Project Mercury. One of its still standing buildings now serves as a makeshift bunker for the media if a rocket explodes near the ground. Mobile Servicing System Control and Training at Saint-Hubert, Quebec, Canada. Supports Canadarm2 and "dextre" robotics operations. Space Systems/Loral Mission Control Center in Palo Alto, California, US. The MESSENGER and New Horizons missions were controlled from the Applied Physics Laboratory near Baltimore, Maryland. Payload Operations Integration Center at the Marshall Spaceflight Center in Huntsville, Alabama were science activities aboard the International Space Station are monitored around the clock. ISRO SHAR Mission Control Centre, Satish Dhawan Space Centre, Sriharikota, India. JEM Control Center and the HTV Control Center at the Tsukuba Space Center (TKSC) in Tsukuba, Japan manages operations aboard JAXA's Kibo ISS research laboratory and the resupply flights of the H-II Transfer Vehicle. JAXAs satellite operations are also based here. The ATV Control Centre (ATV-CC) is located at the Toulouse Space Centre (CST) in Toulouse, France. It is the mission control center for the European Automated Transfer Vehicles, that regularly resupply ISS. Titov Main Test and Space Systems Control Centre, mission control center in Krasnoznamensk, Russia. Space centers involved with the International Space Station. 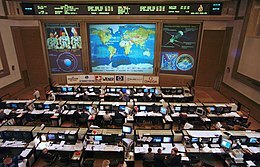 Wikimedia Commons has media related to Space exploration control rooms. ^ "Launch Control Center". NASA. Retrieved 7 September 2011. ^ "Galileo Control Center". GfR. Retrieved 11 April 2019. ^ "Satellite Mission Control Center". Archived from the original on December 30, 2008. Retrieved December 17, 2008. ^ "World Class Satellites and Facilities". Archived from the original on December 25, 2008. Retrieved December 17, 2008. ^ "Overview". Archived from the original on March 13, 2009. Retrieved December 17, 2008. ^ "Pluto Flyby Success! NASA Probe Phones Home After Epic Encounter". Space.com.